Since 1633, the Imperial Crypt. 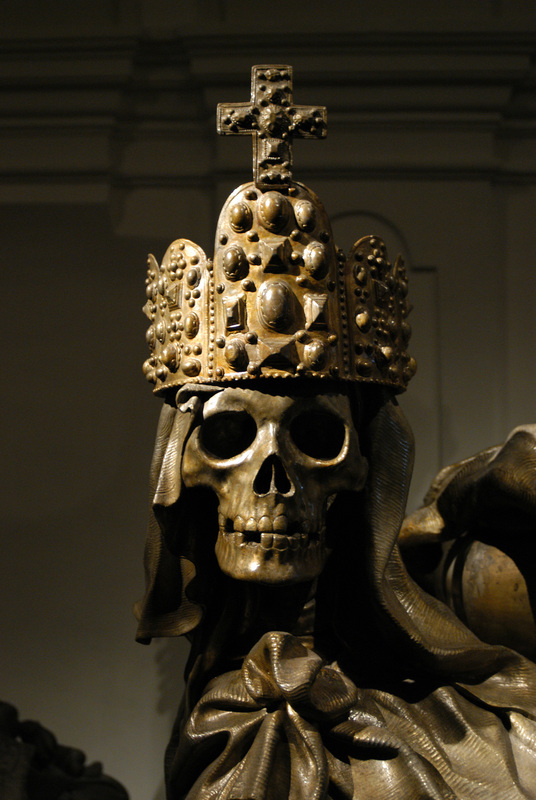 located beneath the Capuchin Church in Vienna, has been the principal place of entombment for members of the Habsburg dynasty. Empress Anna ordered a crypt to be built for herself and her husband, Emperor Mathias. Until today, around 150 Habsburgs, including 12 Emperors and 19 Empresses, were buried here, and the crypt expanded several times. Between 1654 and 1978 the hearts of the Habsburgs were buried in the Heart Crypt of St. Augustin church. The sarcophagi are made of alloy of tin, true bronze or copper. Ornamentation ranges from simple to elaborate baroque and rococo. The double tomb of Empress Maria Theresia and her husband Francis I Stephen is a particular artistic merit. It was sculpted by the famous Balthasar Ferdinand Moll. The simple copper tomb Maria Theresia’s son Emperor Joseph II testifies Joseph’s spirit of enlightenment. He ended the tradition of elaborate funerals for a while. In 1916 the longest reigning emperor was buried here, Emperor Franz Joseph I. Two years after his death the end of the Austro-Hungarian Monarchy had come. The tombs of Empress Elisabeth and Crown Prince Rudolph are to be found in this part of the crypt too. The last empress of Austria, Empress Zita, was laid to rest in 1989. On 16th of July 2011 her eldest son, the former crown prince Otto Habsburg, found his last resting place here in the Imperial Crypt.